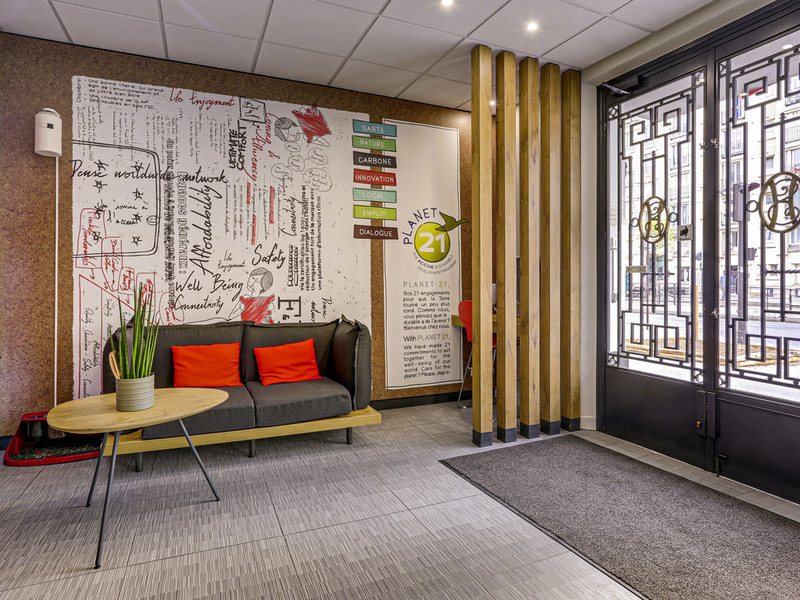 The ibis Daumesnil Porte Dorée lies in the east of Paris, just a stone's throw from Espace Charenton and Bois de Vincennes, 0.6 miles (1 km) from Lac Daumesnil and 1.9 miles (3 km) from Parc Floral. For leisure, visit the Hippodrome de Vincennes, the Château de Vincennes, the Cité Nationale de l'Histoire de l'Immigration and the AccorHotels Arena for sports events and concerts. 12.4 miles (20 km) from Orly airport and near to Gare de Lyon and Gare de Bercy train stations. Enclosed paying public car park. The Ibis Daumesnil Porte Dorée Hotel is near Bois de Vincennes Park, Daumesnil Lake and Parc Floral. For leisure, there is the Vincennes hippodrome, Immigration Museum and Accor hotels Arena. Low confort for very high price! Most standard room I ever had for an extremely high price! The stay was excellent. Great value for your money. Breakfast - excellent Staff - very helpful and kind I would recommend this hotel to any person. Room was dirty, the toilet was not clean, hairs on the bed, cold water in the shower, breakfast buffet always empty, reception employees not friendly, smelly room...my experience was not good. We were surprised about parking for 2 days costed 70 euros. When we booked hotel, we used filters of free parking but we got this hotel showed up. This has nothing to do with the hotel but the app. Clean room and clear and friendly service in close proximity to metro and local restaurants and supermarket. The experience was ok, could have been cleaner, there were some ants and the bathroom smelled badly. The rooms are extremely small, my husband and I could barely move around in the tiny room. There was no safe deposit box to keep valuable items in, they should include private safe deposit boxes in each room, I am sure it won't be a significant investment for the hotel chain. The evening staff was very friendly and welcoming. During our 2 week stay, I've realized that this part of the city is where I wanted to come home to. The streets are quiet and friendly even at night. Well-lit area, the markets for cheap food are just around the corner. There's a food store just across the street that is open 24 hours. Plus there's a bakery! Only thing we less liked is the air conditioning, the thermostat is not working but apparently set on a nice temperature. There's no phone, however, we didn't need it. Overall, it was great experience for me and my girl. Thank you to both the nice reception persons. Pardon, i forgot their names. One blond woman and a man of latin or indian/arab descent. They both speak English well! xoxo AR and Z.
Estimado DAVID P., Le agradecemos el tiempo que se ha tomado para hacernos llegar los comentarios sobre su estancia en ibis Daumesnil Porte Dorée. Sentimos enormemente que su experiencia no haya alcanzado sus expectativas; por favor permítanos hacerle llegar nuestras mas sinceras disculpas. En Ibis, nos esforzamos en proporcionar un servicio de calidad a cada uno de nuestros clientes, por ello sus comentarios son muy importantes para nosotros. Por favor tenga por seguro que tomaremos las medidas necesarias para que no vuelva a ocurrir lo acaecido en su estancia. Apreciamos sinceramente que haya compartido con nosotros este asunto y confiamos en que nos dé una nueva oportunidad para poder ofrecerle un servicio óptimo. Reciba un cordial saludo. Noisy room, too hot and no AC, tiny single bed. I could hear the very noisy lift all night - I didn't sleep The maid came in my room (without warning) at 6:30 while I was in bed. The AC did not work The bed is a tiny single with two cheap mattresses stacked up. Location atop Porte Doree metro could not be better. Very clean, and useful left-luggage service. Friendly multi-lingual staff. With chain cafés adjacent (Sub, Mac and BK) I might skip the €10 breakfast next time. Great location and great staff. Wi-if didn’t work. Loved the hotel, though the room was small. Very clean and the staff was wonderful. They were very nice and super informative. The wi-fi didn’t work though. That’s really the only negative thing that I can say. The breakfast that was included was wonderful, the location was great, and on Christmas, the cleaning staff even left us a handwritten “Merry Christmas” note with some chocolates! Room facilities,Cleanness and breakfast was ok! But rooms very small! In room Safebox was absent! It's not very clear how to open the hotel door from the outside. You have to pay the hotel manually. Most Accor hôtels are paid directly with the reservation made with the app and an Accor account.